I don’t eat out a lot but last year I was lucky enough to try milk sorbet TWICE at two different restaurants. The first was at ‘The Peacock‘ in Rowsley where it was the perfect companion to a dense chocolate tart. The second was at the wonderful ‘John’s House‘ in Mount Sorrel where it came on top of a hot rice pudding – an odd sounding pairing but an absolute delight. After these two memorable food experiences I decided to try and make it myself. This recipe from Donna Hay was the first that came up on a google search and I haven’t bothered to try any others because it is perfect. We are divided in our family as to whether milk sorbet is preferable to a good old-fashioned vanilla ice cream but I’m totally convinced that it is better in some circumstances, such as with very rich deserts where it offers a lighter and more refreshing note of contrast. It is great just on its own though (I seem to say that a lot on this blog). You will need an ice-cream maker for this recipe. As I’ve said before, I have a Magimix Le Glacier ice cream maker – the cheaper sort where you have to freeze the bowl overnight before using. This remains one of my best used kitchen appliances*. *PS. I have not been paid by Magimix to say this. Place the sugar and water in a saucepan over high heat and stir until dissolved. Bring to the boil and cook for 4 minutes, stirring occasionally. Set aside and allow to cool completely. Once cool add the milk and lemon juice. Churn in an ice-cream maker until firm (about 20 minutes) and freeze until required. You will need to leave the sorbet at room temperature for around 30 minutes before serving. ‘Half Term Treat – Mary Berry’s Honeycomb Crunchies’ is by far my most successful blog post to date – if you judge success by the number of hits that is. This is quite depressing really because I wrote it with minimal effort, in a rush, with the children nipping at my heels. I love honeycomb and when I had this ice cream at a dinner party recently I was in absolute heaven. I just had to look up the recipe and try it. Mary makes the honeycomb in exactly the same way as in the crunchies recipe and mixes it with a ‘cheat’s’ ice cream that doesn’t need an ice cream maker. It’s so easy to make and I look forward to trying this ice cream technique with other flavours. Measure out the bicarbonate of soda and set aside. Then line a flat baking tray with baking parchment and lightly grease with a flavourless oil. Put the sugar and golden syrup into a saucepan and set it on a very low heat for about 10 minutes until all the sugar has melted, stirring occasionally with a wooden spoon. When the sugar is completely melted, turn up the heat to medium. Once the mixture has started to boil, leave to bubble without stirring until it turns golden-brown (this only takes a couple of minutes). Turn off the heat, add the bicarbonate of soda and quickly whisk for a couple of seconds. The mixture will froth up massively so make sure you use a saucepan with plenty of room. Quickly pour it into the middle of the oiled baking tray and don’t spread it out or touch it or the tray. Leave for about 30 minutes to cool and harden. You can hurry things along by putting it into the fridge after about 15 minutes. Now break the honeycomb into bite size pieces. Set a third of the honeycomb to one side for decoration, the rest will go into the ice cream. For the ice cream, whip the cream in a large bowl until it has soft peaks. Then pour in the condensed milk and stir well to combine. Fold two thirds of the honeycomb into the ice cream. Pour the ice cream mixture into a loaf tin lined with cling film, cover with more clingfilm and freeze for 6 hours or overnight. When you are ready to serve, turn out onto a serving dish and top with the remaining honeycomb. We’ve had a really tough week. Ben’s dad died. We knew it was coming (he had cancer) but this didn’t make it any easier. My first instinct is to turn to food for comfort (I think it’s the only way I know). And for our family ‘happy’ foods would be ice cream or perhaps a home baked loaf. So on Sunday we had a sugar-crazed ice cream ‘mash up’. I made vanilla ice cream and presented it with a selection of sauces, with sweets to garnish, in true ‘Pizza Hut Ice Cream Factory’ style. This was reminiscent of sleepovers when I was 14 where we would eat pizza and ice cream until we felt sick and then watch naff horror films like Nightmare on Elm Street or Child’s Play. The ice cream ‘mash up’ was fun and temporarily took our mind off things. Only just like my teenage self we got over excited and ate so much that we felt ill and had to lie down and listen to audio books (in lieu of television) for the rest of the day. In the end it was the next morning’s freshly baked bread that won through. Slathered with real butter this was the stuff of true, wholesome, everyday happiness. With Ben away watching over his ailing father, it has fallen on me to make the daily bread. I had to ask for his current recipe which has been updated since the one I posted back in September 2013 (the main change being the larger size since our children now eat more than we do). So please find below four recipes for ice cream sauces and one for a good loaf of bread. Peace be with you David Shelton (1950-2017). For my homemade vanilla ice cream recipe click here. Or just buy some ready made. Each of the sauce recipes below makes a jam jar full. More than you’ll need for one session but they will keep well in the fridge for a couple of weeks, or you could freeze any leftovers. Heat all the ingredients slowly in a saucepan until everything is melted and amalgamated. Best served warm. Heat all the ingredients slowly in a saucepan until everything is melted and amalgamated. This creates a thick sauce. Add a little more full milk or double cream if you want it thinner. Combine all the ingredients in a saucepan set over a low heat, and stir until the sugar has dissolved. Turn the heat up and bubble the sauce for 2-3 mins until golden and syrupy. Leave to cool for 10 mins before serving. Can be made up to 3 days in advance and chilled – gently reheat to serve. The other option is to open a tin of caramel condensed milk and add a good pinch of Maldon sea salt. Heat the raspberries (straight from frozen) with the icing sugar over a low heat in a saucepan on the hob. Let it simmer for a few minutes (3-5). I like a smooth texture with no pips so I sieve the mixture before serving but this is a total pain and does take ages (plus nightmare washing up to get the pips out of the sieve). If you don’t mind pips then just skip this step. Or, alternatively, whizz up a tin of raspberries in syrup and sieve (or not). Sumptuous sauces (clockwise from top left, raspberry, milk chocolate peanut, salted caramel and dark chocolate). Add all the ingredients into a large mixing bowl. Bring together with your hands and knead for at least 10 minutes. Leave in the bowl covered with cling film until it has at least doubled in size – usually 2 hours but this may take a bit longer if it’s a cold day. Knock back the dough with your hands and knead gently for another minute. 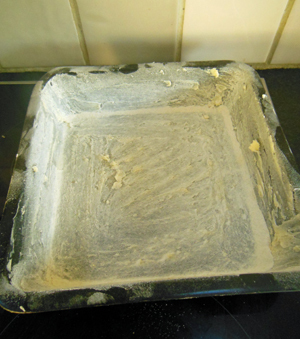 Grease a large bread tin (mine is 28.5cm long, 13.5cm wide and 7cm deep) and press the dough into the tin. Leave to rise in the tin for another 30-60 minutes. The dough needs to reach just above the top of the tin and this for me usually takes around 45 minutes. Preheat the oven to 220oC or 230oC if, like me, you like a really golden crust and put a tin of boiling water in the bottom of the oven to create some steam (this also helps with the crust formation). Bake for 18 minutes at 220oC/230oC. Then remove from the tin and bake for 17 minutes at 180oC. Leave to cool before slicing. The above photo does not do this pudding justice. I was a bit tipsy by the time I served/photographed it (as one often is after two previous courses and two bottles of wine!). On the subject of food photography, I really enjoyed reading this article by the brilliant Ruby Tandoh about sharing pictures of food online. In it she argues that food that looks amazing doesn’t always taste so. I particularly loved this paragraph and I will bear it in mind every time I beat myself up about my poor photographs for this blog. Whilst my photos maybe a bit crap they are at least honest and the food has tasted good (otherwise I would not offer you the recipe). If you want to post your meal online, post away. Upload a picture of that sausage and mash. Don’t worry that the light is dim, that the gravy sloshes in a swampy pool across your plate. Sharing is a generous act, but perfectionism smothers that goodness. Upload the unfiltered, ugly pictures of your failed birthday cake, or your fish and chips in grease-soaked paper. Or, if you want to fuss over the exact positioning of four blueberries on top of a smoothie bowl for an hour before you tuck in, do that – but don’t forget to enjoy your food. Getting back to the point, it was my 10th wedding anniversary on Friday and to celebrate I wanted to cook a special meal inspired by the food served at our wedding. Our ‘big day’ was not at all fancy and our budget cake was a Chocolate Guinness one kindly made by my sister. I wanted to remember this in my anniversary menu but I don’t believe in serving cake as a dessert (unless it’s hot with custard). So I had the idea of making hot chocolate fondants flavoured with Guinness instead. And then to mirror the cream cheese icing on the cake serving the fondants with a cheesecake ice cream. It worked really nicely so here are the recipes. Butter four ramekins with butter and place in the freezer to chill. Set your oven to 170oC. Melt the butter and chocolate in a pan over a low heat or in the microwave. Allow the mixture to cool a little and then stir in the two egg yolks. In another bowl, beat together the two whole eggs, sugar and Guinness until light and foamy. 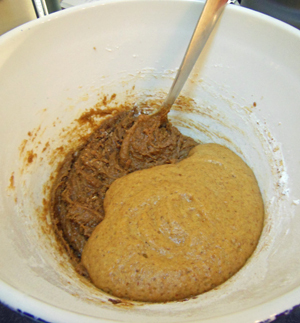 Fold in the chocolate mixture and the flour with a metal spoon until well incorporated. Spoon the mixture into the chilled ramekins and bake for 9 minutes, or until the surface is set but there is a slight wobble in the middle. Turn out onto plates and eat immediately with cheesecake ice cream (see recipe below). NOTE: You can make these up in advance and keep covered in the fridge until you want to bake them. This is good if you’re making them for a dinner party. They also taste fine baked and then reheated in the microwave the next day. In a bowl beat together the sugar, Philadelphia, vanilla and egg. Heat the milk in a saucepan until hot and then pour this over the cream cheese mixture. Then pour the whole lot back into the saucepan and place over a medium heat until the mixture thickens, whisking all the time. Try not to let the mixture boil or it will curdle. Once the consistency of smooth custard, remove from the heat and whisk periodically until cooled to room temperature. Then place in the fridge to get really cold. Finally add the double cream (lightly whipped) and lemon juice and pour into an ice cream maker. Churn until thick then put in the freezer to finish hardening. Here’s a random photo of some baguettes I made this week. Aren’t they beautiful? Not beautiful but very happy – Ben and I on our wedding day 10 years ago. Cooked banana is like marmite, you either love it or hate it. I absolutely love it (I take after my father here). If I ever see banana fritters (AKA: Pazham Pori, Toffee banana, Glouy Tod) on a dessert menu then I just have to order them even if I’m already stuffed. We won’t talk about my gannet-like behaviour at the Golden Dragon in Shardlow where they offer banana fritters as part of their all-you-can eat Sunday buffet. I recently I had the best banana fritters (Glouy Tod) I’ve ever eaten at ZAAP Thai in Nottingham and it made me want to try making them myself. I’ve had a go before with a simple flour and egg batter (not a great success) but the addition of coconut and sesame seeds here adds something extra special. Now I need to forget that I’ve ever discovered this recipe or I’ll end up the size of a house. Mix all the ingredients for the batter together in a bowl until smooth. Start with 3 tablespoons of water. At first the consistency will be slightly weird because of the cornflour (both runny and thick at the same time), you need to add just enough additional water for the mix to be smooth without the cornflour resisting being stirred (hopefully this will make sense when you do it). The original recipe uses rice flour so you can use this if you prefer. Tip in the banana and stir gently with your hands until each piece is well covered with the batter. Fill a frying pan with enough groundnut oil to cover the whole bottom of the pan and heat to a medium-high heat. Put each piece of battered banana into the hot pan and fry on each side until golden brown (about 3 minutes each side). You may need to do this is two batches depending on the size of your pan. You can also deep fry them if you like. In this case they only take around 2-3 minutes. Make sure your oil is really hot though. Lift out with a slotted spoon and drain on some kitchen towel. Eat immediately with golden syrup drizzled over the top and coconut or vanilla ice cream on the side. NOTE: For the coconut ice cream follow this recipe for vanilla ice cream but substitute half the double cream for coconut cream, omit the vanilla essence and add 3 tablespoons of dried unsweetened coconut before churning. Served on its own with chocolate sauce this would be like a frozen Bounty. I don’t own a mobile phone and I’m not on facebook (which I hate) but I do rather uncharacteristically use (and even like) twitter. And I don’t mind admitting that this is mainly to salivate over pictures of beautiful food. Some people may find it super sad but I really am interested in what Nigella (who lives a life of glamour and privilege so far removed from mine) is eating for lunch. I also follow my almost-neighbour and culinary magician Sat Bains (although I could happily do without the macho gym and gun photos) and he once tweeted a picture of his miso fudge which had me dribbling all over my laptop. I could literally taste how great that flavour combination would be. Despite not being able to try the real thing (because I’m not wealthy enough to eat at his restaurant on even a yearly basis) the idea stayed imprinted in my brain. Then recently I came across a recipe for miso caramel in Tim Anderson’s new Japanese cookbook ‘Nanban’ and so I just had to give it a go. 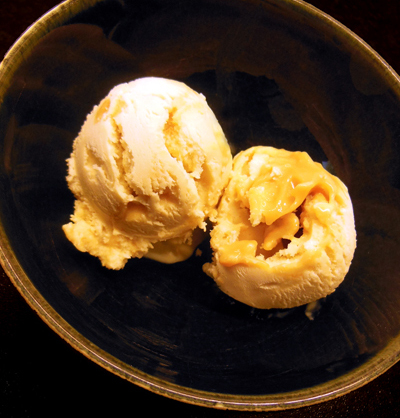 In Tim’s recipe he uses the miso caramel to flavour a ‘whippy’ ice cream (made with cornflour not egg yolk) and mixes it in completely. In my version I use my favourite standard vanilla ice cream recipe (only this time I replace the caster sugar with brown sugar) and then use the miso caramel as a ripple. This way you get a pure hit of sugary umami* (for all those Sat lovers out there you’ll know what this means). All pretensions removed, if you like ice cream, salted caramel and Japanese flavours then it’s very likely that you’ll love this ice cream. First make the caramel. Heat the milk in the microwave or in a pan until it is nearly boiling. Then put the sugar and water in a saucepan and heat slowly until the sugar has dissolved. Raise the heat to medium and let it bubble away until in turns a dark amber caramel. Keep a careful eye on things because it will turn very quickly. Whisk in the hot milk but be careful because it will bubble up. Keep whisking until all the caramel has dissolved. Remove from the heat and whisk in the miso and vanilla extract. Pass the mixture through a sieve and then return to the heat and let it simmer away until it thickens up a bit. You want a nice thick pouring consistency. Leave to go completely cold. Now for the ice cream. In a bowl beat the egg yolks, cornflour and sugar together. Heat the milk in a saucepan slowly until it is almost boiling and then stir this into the egg and sugar mixture. Tip the whole lot back into the pan and place on a medium heat stirring continuously with a whisk until the mixture thickens enough to coat the back of a wooden spoon. Try not to let it boil or there will be a chance it will curdle and ruin. Cover the mixture and leave it to cool first to room temperature and then in the fridge. Once cold, stir in the cream and churn in an ice cream maker until thick. To assemble, take a plastic container and first put in half the ice cream mixture, then drizzle over half the caramel. Spoon in the remaining ice cream and then finally the rest of the caramel. Take a butter knife and run it through the mixture in a wavy motion to create the swirl. Place in the freezer to finish hardening. If you like ice cream and don’t already have one I really do recommend buying an ice cream maker. I have a Magimix Le Glacier ice cream maker – the cheaper sort where you have to freeze the bowl overnight before using (about £50 from John Lewis or Argos). If you don’t have an ice cream maker then you can still follow this recipe but you will need to whip the double cream first before adding it to the milk/egg/sugar mixture. Fold the cream into the custard and then freeze, beating every couple of hours with a fork or in a food processor until it is firm enough to scoop (usually about 6 hours). If you really can’t be bothered with making ice cream then just make the caramel and pour over shop bought vanilla. I once walked along the line of Hadrian’s Wall from Newcastle (on the west coast) to Bowness-on-Solway (on the east coast) over a period of 8 days. 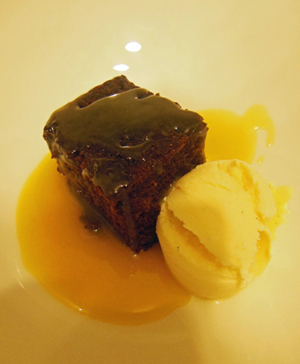 Every evening we ate at the local pub and almost every evening I’d finish my meal off with a sticky toffee pudding. I just couldn’t get enough of it and it felt totally guilty free – surely I deserved it after all that walking! For years I only ever ate sticky toffee pudding as a special treat when eating out but then I came across this recipe, attempted to make it myself, and that was when I discovered the secret. You see I know why sticky toffee pudding is nearly always on the dessert menu in pubs and restaurants. Firstly, it’s not particularly difficult to make, secondly, it keeps for up to a week in a tin, thirdly, it can be frozen, and fourthly, and most importantly, it tastes pretty much the same reheated in the microwave as it does fresh from the oven. Don’t be put off by the fact that there are two separate elements (sponge and sauce) and some whizzing of dates in a food processor – it’s really not that complicated (although there is a little more washing up than an all in one sponge cake). This recipe is adapted from the one in James Martin’s book ‘Desserts’ – nauseatingly subtitled ‘a fabulous collection of recipes from Sweet Baby James’ (seriously, who came up with that TV series title?). He in turn attributes the recipe to the owners of the Sharrow Bay Hotel on the banks of Lake Ullswater in the Lake District who he believes invented the dish. Apparently there is some dispute over this, but regardless of who thought it up, in my view it’s one of the best puddings there is. I’ve also included a recipe for classic vanilla ice cream which makes a perfect accompaniment. It also tastes wonderful with just the toffee sauce if you have no room left for stodge and the end of a meal. Preheat the oven to 190oC fan. Grease a 20cm squared tin (or one with the same area) with 15g of butter, then dust the inside of the tin with flour. Mix the sugar and butter together with an electric hand whisk or by hand with a wooden spoon. Then add the golden syrup, black treacle, eggs and vanilla extract and mix again for a minute or so until well combined. 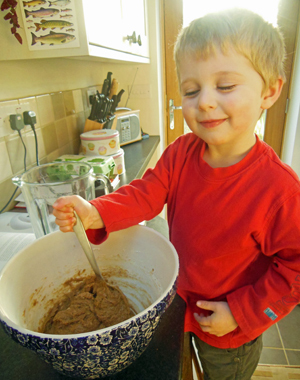 Add the flour and fold into the mixture carefully with a metal spoon. Put the dates in a saucepan with 300ml of cold water and bring to the boil. Transfer to a blender and whizz up for a minute until smooth. Add the tablespoon of bicarbonate of soda and whizz again for a second. The mixture will foam up quite excitingly. While it is still hot tip the date mix into the other ingredients and fold with the metal spoon until well combined. Transfer to your prepared tin and bake for 45 minutes or until a skewer poked into the middle of the cake comes out clean. Remove from the tin and allow to cool on a wire rack, before cutting into portion sized squares or rectangles. I like to trim the edges if I’m trying to be fancy but these are perfectly good to eat as leftovers. If you are making this pudding in advance then wrap in foil when it is completely cool and store in a cake tin or Tupperware. 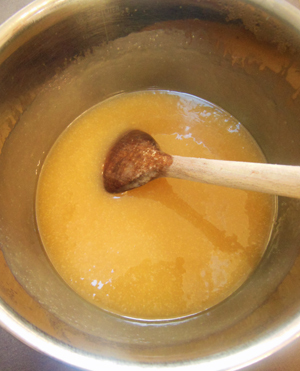 For the toffee sauce put the sugar and butter into a saucepan over a medium heat until the sugar has dissolved. Add the cream and bring to boiling point. Stir continuously for about 5 minutes until the sauce has turned golden and has started to thicken. When you are ready to serve you just need to reheat the sauce in the pan on the hob or in a jug in the microwave for a minute or two. The sponge can be reheated as a whole in the oven covered with foil for about 5 minutes at 180oC fan or in individual portions in the microwave for about 30 seconds. You can also freeze individual portions of toffee and sauce. When the toffee sauce has turned this colour remove it from the heat. In a bowl beat the egg yolks and sugar together. Tip the whole lot back into the pan and place on a medium heat stirring continuously with a whisk until the mixture thickens enough to coat the back of a wooden spoon. Whatever you do don’t let it boil or it will curdle and ruin. Cover the mixture and leave it to cool first to room temperature and then in the fridge. Stir in the cream and the vanilla extract and churn in an ice cream maker until thick. Place in a plastic container and transfer to the freezer to finish hardening. NOTE: I have a Magimix Le Glacier ice cream maker – the cheaper sort where you have to freeze the bowl overnight before using. If you don’t have an ice cream maker then you can still follow this recipe but you will need to whip the double cream first before adding it to the milk/egg/sugar mixture. Fold the cream into the custard and then freeze, beating every couple of hours with a fork or in a food processor until it is firm enough to scoop (usually about 6 hours).